New York & Co is an American based nationwide retailer of trendy fashion brands for feminine clothing, stocking pants, tops, gowns, suits, denim, shirts, dresses, handbags, scarves, footwear, jewelry and gifts. It stocks stylish items for the right value. New York & Co offers the latest trends, with attractive features such as bonuses and free items for customers. New York & Company: Get 60-80% Off Warehouse Sale. 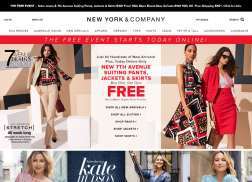 New York & Company: Get 50% – 80% off Epic Dress Event. Over 100 styles & colors. New York & Company: Get 40%-50% off Sweet Pea collection by Stacy Frati. New York & Company: No coupon code needed. Tap to shop the sale now. New York & Company: Get 50-71% off Party Dresses. New York & Company: Get $25 Off $100+ Regular-Priced Purchases. Only one certificate, coupon or discount per purchase (pre-tax). Cannot be combined with other coupons. New York & Company: Get 60% – 80% off Cyber Warehouse Sale. New York & Company: Get 50-60% off The Entire Gabrielle Union Collection. New York & Company: Get 40% to 75% Off The Entire Eva Mendes Collection on Sale. New York & Company: New Year’s Eve! Get 30%-60% Off Dresses. New York & Company: Get 40% to 75% Off The Entire Sweet Pea Collection On Sale. New York & Company: Tap offer to copy the coupon code. Remember to paste code when you check out. Online only. New York & Company: Get $50 Off $150+ Regular-Priced Purchases. Only one certificate, coupon or discount per purchase (pre-tax). Cannot be combined with other coupons. New York & Company: Get 30%-80% off Always Flattering Faux Leather All Dresses.